Millions of viewers the world over reeled in horror as Herman Maier's downhill run at the 1998 Nagano Games ended in a terrifying flight and a top speed brush with death. But he dusted himself down and won both the super-G and giant slalom golds a few days later. He also suffered a terrible motorbike accident that almost cost him a leg, and on his return 22 months later he won a World Cup race at Kitzbuhel. He came to be known as 'the Herminator', after the sci-fi film character 'Terminator' played by his compatriot Arnold Schwarzenegger, whose famous catch phrase 'I'll be back' and relentless pursuit, seemed tailor made for Maier. In all he won four Olympic medals, three world titles, four overall World Cup titles, and well as two downhill globes, five super-G titles, and three giant slalom crowns as well. But above all he won 54 individual World Cup races, second best ever behind the untouchable Swede Ingemar Stenmark who finished his career with 86. He began skiing aged five as a member of the Salzburg club and went to a school where ski was a key endeavour. When leaving school he worked as a bricklayer in summer and ski-instructor in winter. 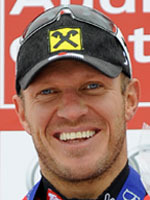 He was a relatively old 23-years of age before his first World Cup race, a giant slalom at Hinterstoder in February 1996. A year later he would climb to the top step of the podium at Garmisch, winning the super-G.
A year down the line at Nagano he had been favourite to win the downhill, his dramatic fall propelling him to world fame, the golds in the super-G and giant slalom confirming his legend. That season, some 28-years after Karl Schranz had last done it for Austria, he won the overall World Cup title. It was the start of his reign at the top: next up came a downhill and super-G double at the 1999 worlds, crystal globes in the downhill and super-G, overall World Cup titles in 2000 and 2001, a year in which he took a record equalling 13 individual wins on the circuit. Then, in August 2001, came the bike accident that led doctors to ponder the amputation of his right leg, so he was absent two full seasons, missing the 2002 Games at Salt Lake. But he didn't get his nickname 'Herminator' for nothing, his January 2003 comeback resulting in a super-G victory at Kitzbühel after 22 months without a competitive race. He was runner-up in the super-G world championships a month later and won his fourth and final World Cup overall title in 2003-2004. He claimed a final major victory with a world championship gold in the 2005 giant slalom race and claimed his other two Olympic medals in 2006 with silver in the super-G and a bronze in the giant. His 54th and final World Cup win was the super-G at Lake Louise, Canada in November 2008. When he announced his retirement in October 2009 after 14 seasons at the top, his popularity was unrivalled, his bravery, style and rapport with the public making him an international star, a millionaire, and one of the never-to-be-forgotten champions.